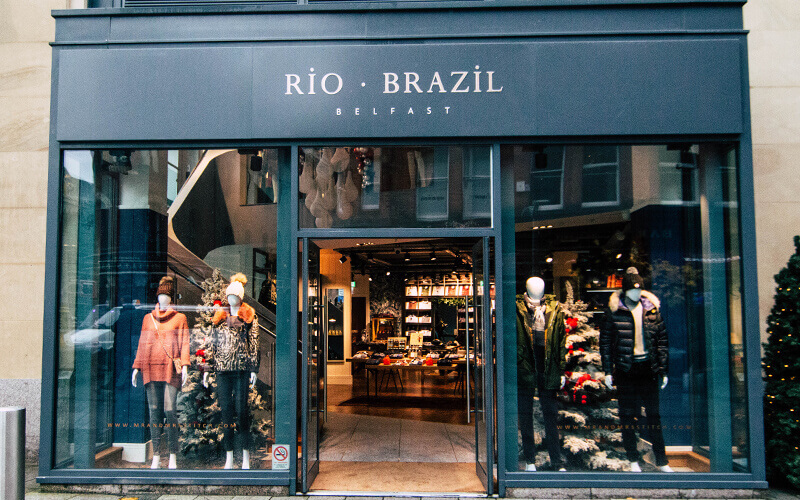 One of Belfast’s longest running independent fashion boutiques relocated to Victoria Square in October 2017. Located within a large and bright two storey unit opposite the Kitchen Bar and beside Ground coffee shop. Rio and Brazil provide a personal service delivered by experienced and knowledgeable staff. There is an individual collection of both men’s and women’s clothing brands which are not represented else where within Victoria Square. Some of these unique brands include; Paul Smith, Jacob Cohen, Scotch and Soda, Napapijri, R M Williams, Grenson, Jeffery West Mainline, Woolrich, Rossignol, Colmar, Parajumpers, Kent and Curwen, Eton, High, 2nd Day, Mackage and Pairs in Paris.